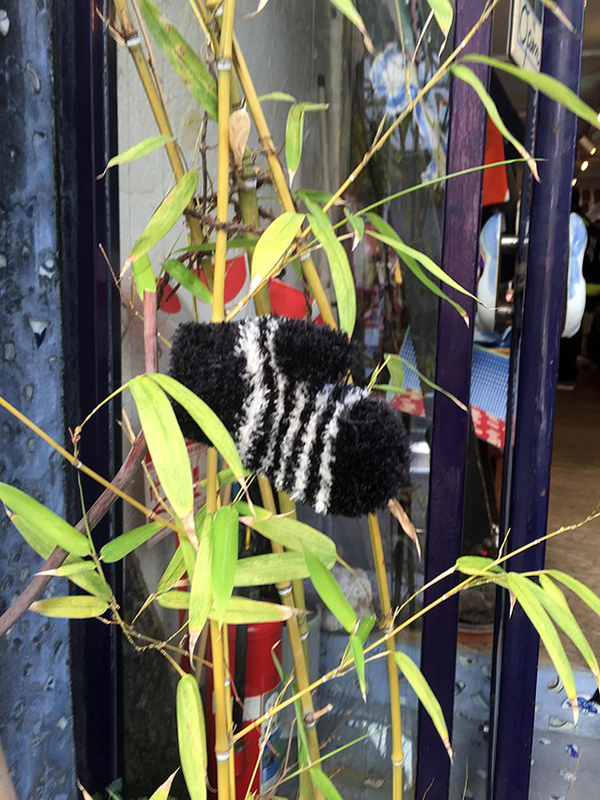 It’s the time of year in Japan when little boys drop their mittens and kind people, shopkeepers pick them up and hang them in a conspicuous place where they can be easily found. 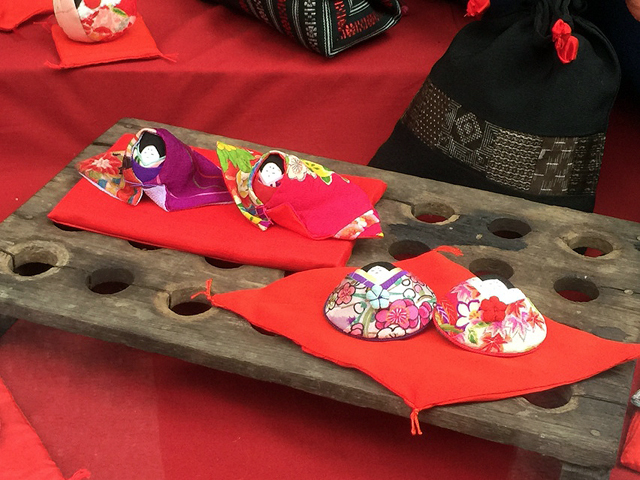 It is also time for OHina Matsuri, Dolls’ Festival when little girls, and older ones too, dream of emperors and empresses, of princes and princesses and all their retinue. 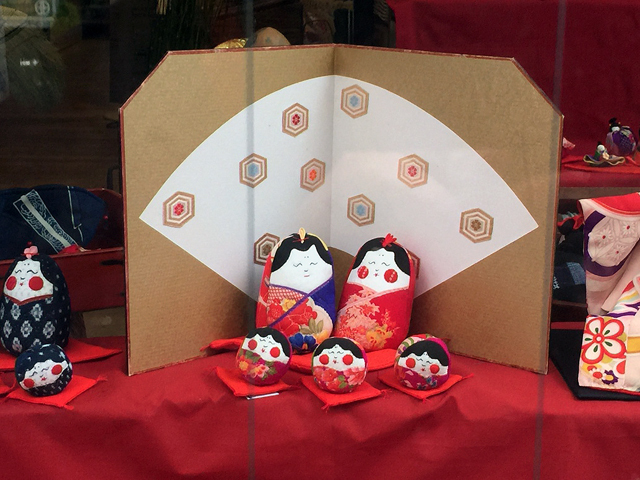 In most houses in Japan, where there are daughters, families set out their OHina dolls for display and celebration. In some houses, when a daughter is born, the grandparents or parents rush out to buy a new set of dolls to celebrate. Some girls take their OHina sama dolls with them when they marry. Peach blossoms are arranged to accompany the dolls, special sweets and foods are set out to celebrate the glad occasion, as has been done for over 1000 years! 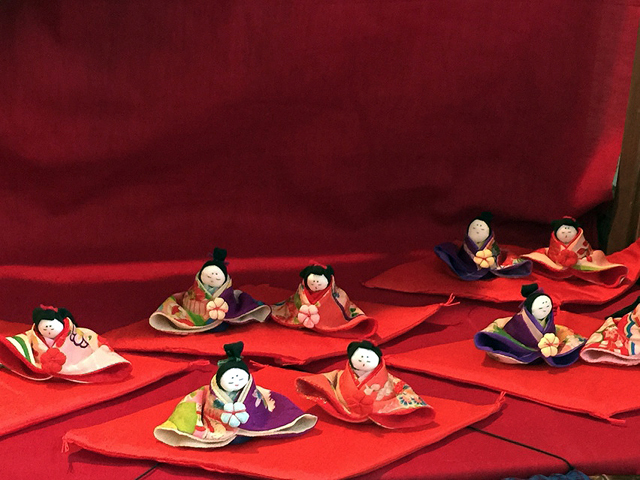 It is a tradition that first started in the Heian Period when dolls were floated down the river to wash away evil spirits. But as usual, Blue & White does it differently. 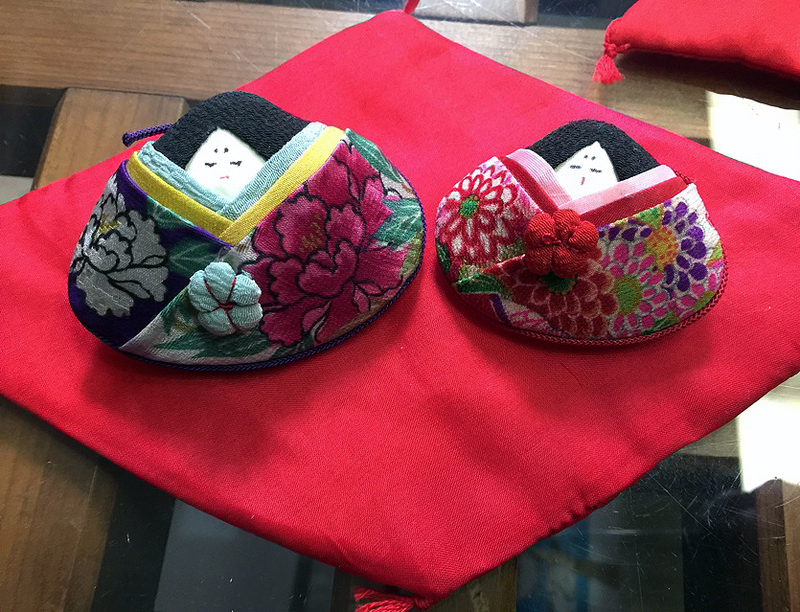 Below clamshells have been dressed in regal kimono to symbolize the emperor and empress by Reiko Okunushi, Blue & White’s indefatigable seamstress and magician. 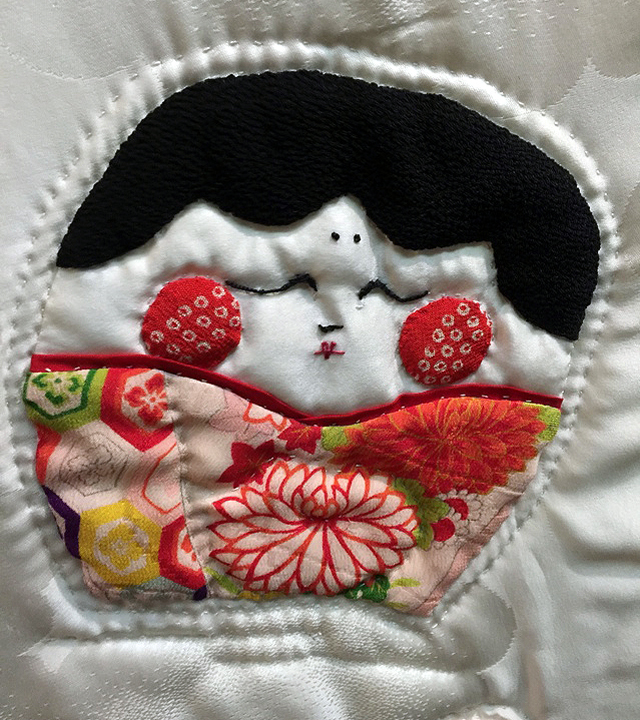 A charming cross between OHina sama and fat cheeked Otafuku, Japan’s Goddess of Mirth, these puckered silken ladies emit smiles and a certain carefreeness that we all respond to. 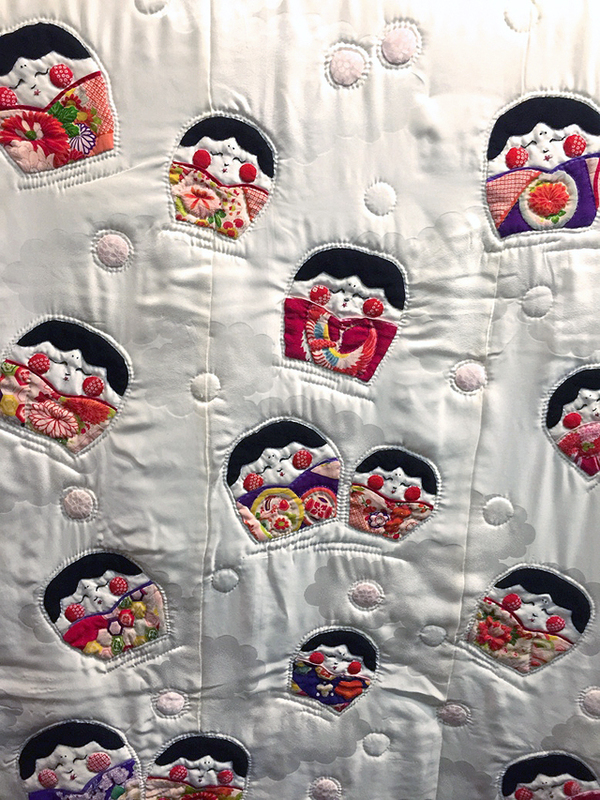 Reiko Okuniushi’s whimsical Ohinasama quilt made with vintage material by fingers that dance and hands that persuade old silk to do things it never dreamed of doing. Oh! the patience! Oh the dexterity that these dolls require at the time of year when my own rough and clumsy fingers catch the threads of silk and make runs in my stockings. The antique kimono silk does just what Okunushi san asks it to do. Her dolls are infused with humor and playfulness that reveal her joy of life to all who see them. Tradition adapted. Emperors and Empresses of silk and clam shells are arranged on an antique wooden frame/tool, a far cry from the usual graduated steps covered with red felt where they are usually displayed. 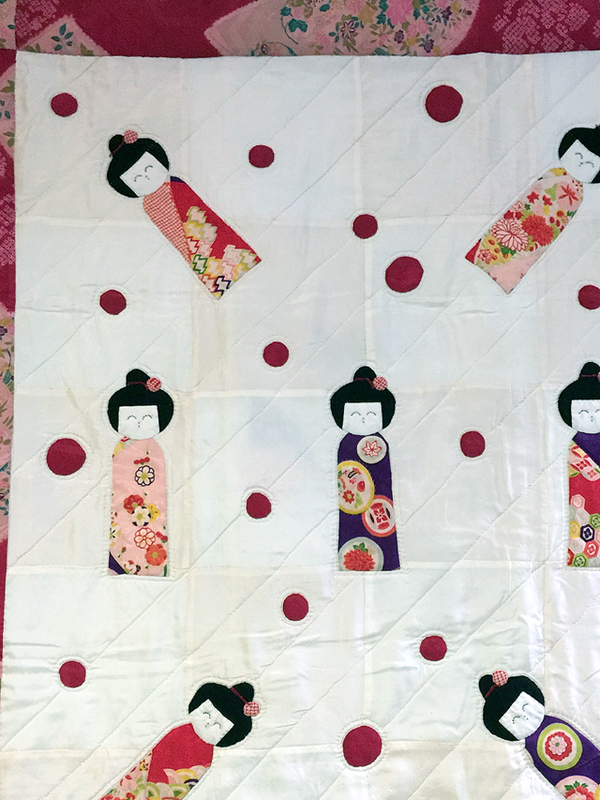 An array of imperial dolls sits in solemn splendor, resplendent in their antique kimono robes painstakingly stitched by Reiko Okunushi. Okunushi san marries the sharp and simple contrasts of blue and white country indigo cotton kasuri with the sophisticated colors and designs of vivid kimono silk and gives them both new impact – and playfulness. 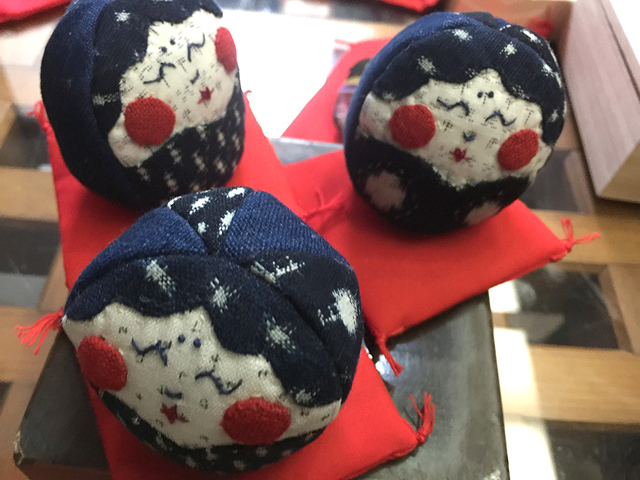 Three Otafuku Ohina Sama Daruma Muses – each in her own world, thinking her own thoughts. Don’t Forget Blue and White Okunushi san is equally at home in blue and white as she is in silken kimono fabrics. 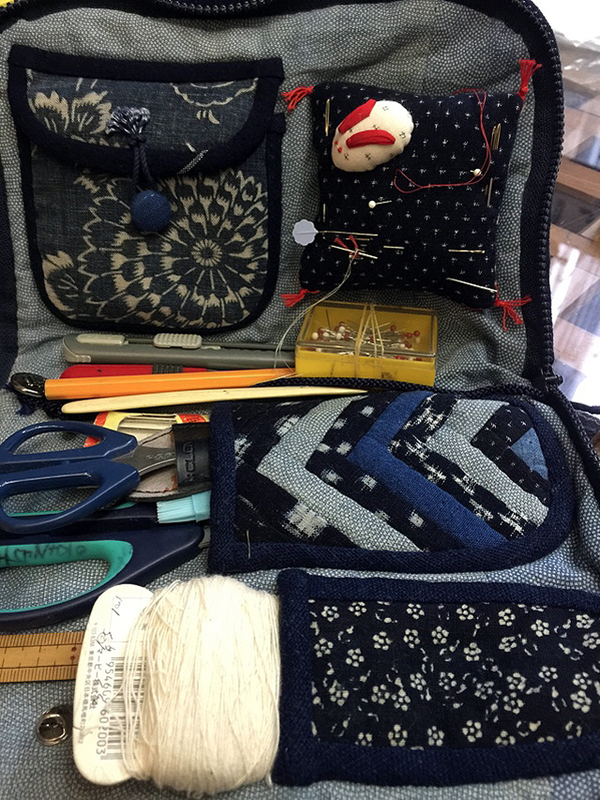 Okunushi san’s traveling sewing kit has all she needs to create her magic on the road. She expresses herself with needle and thread in a way that most people cannot do with words. Her secret dreams are in her stitches. 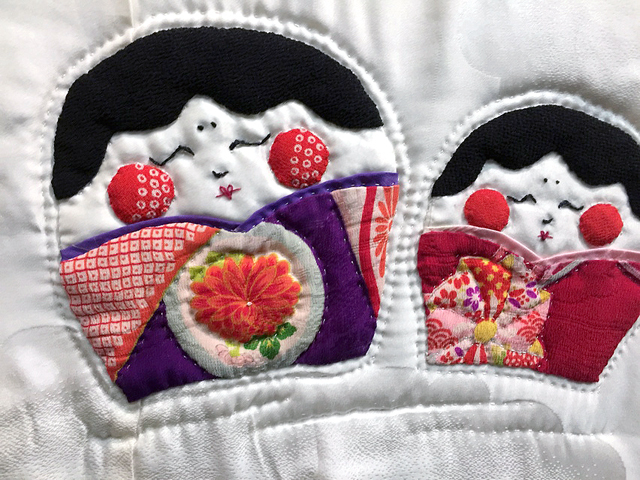 Never one to cut up a textile – kimono, yukata or obi that is in wearable condition, Okunushi san works her magic with discards and otherwise unusable textiles. And she uses them to the very end. 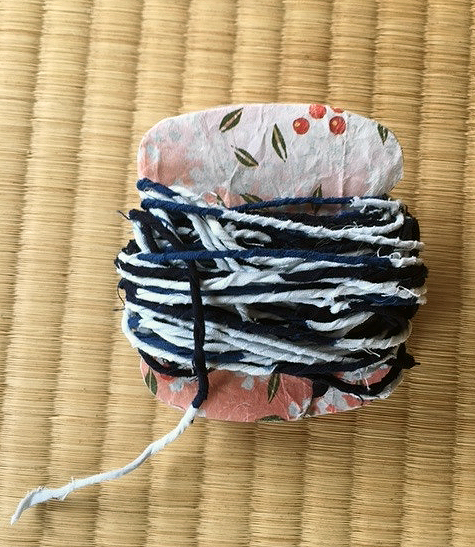 Here is a spool of her leftover snippets of yukata material knotted to make wonderful twine for presents and other wrappings. Wound around a recycled bit of decorated cardboard, this length of cotton string is simple alternates of blue and of white. Something I treasure , along with the other only you! creations of Reiko Okunushi. 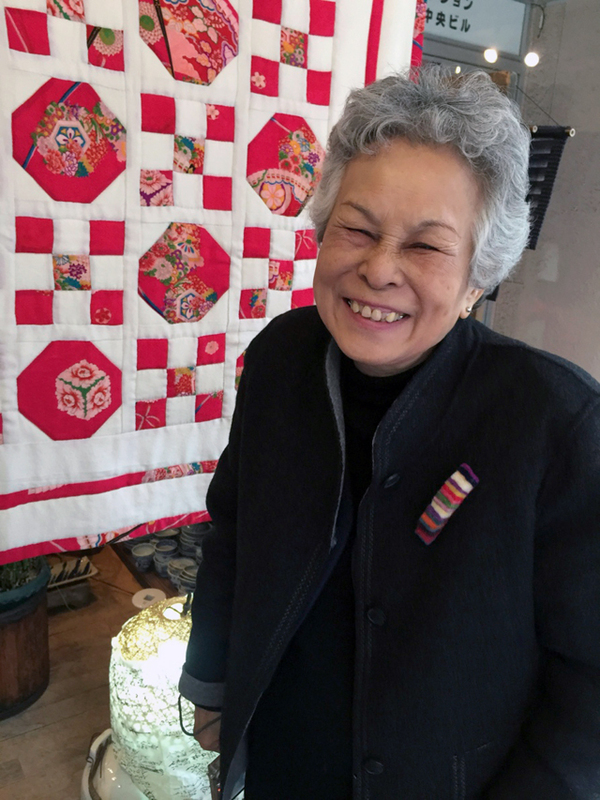 Reiko Okunushi, Blue & White seamstress divine, and master quilter. 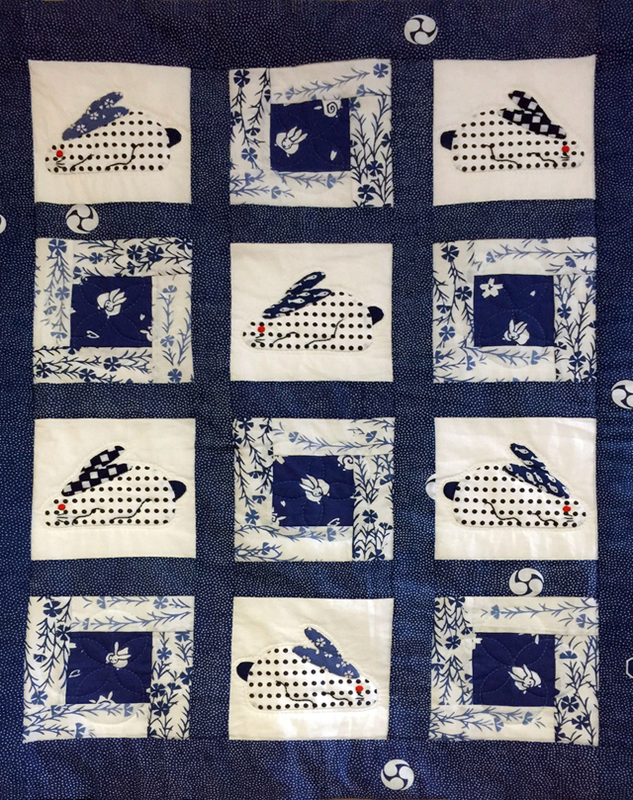 takes pieces of cast away material and gives them new life and playfulness with her quilt designs. Her love of textiles assures their being given new life to the very last bit. Her fanciful creations exude joy and whimsy that is infectious. These pin wheels make me spin with their energy. 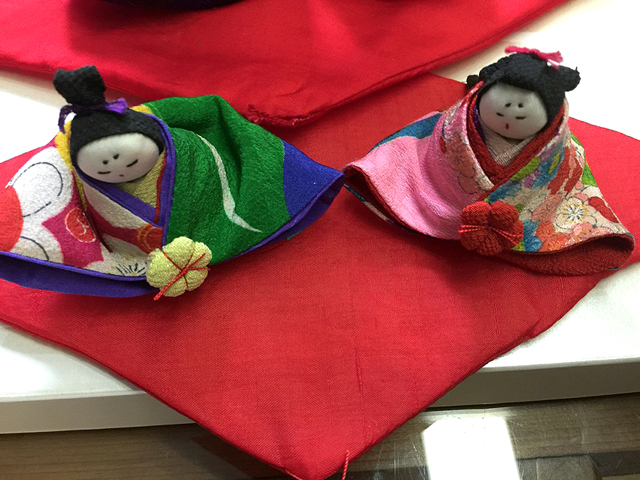 Her silken kokeshi are soft and almost huggable. 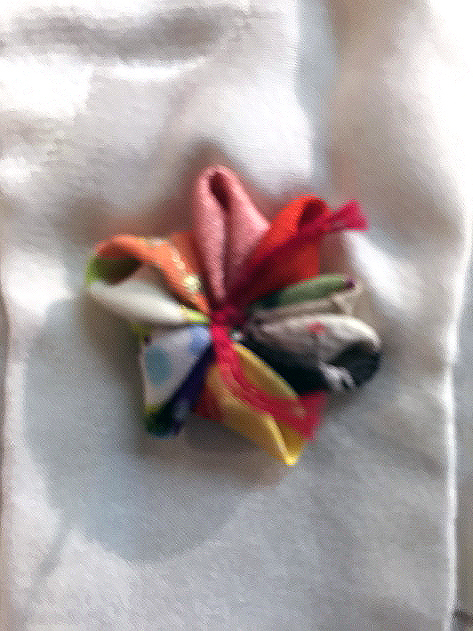 Okunushi san is with me always in the colorful pinwheels that spin on her bright kimono quilt, and on the many Otafuku images she has sewn for me. She generously says that she want to be my hands, a welcome offer to one who is hopeless with a needle and scissors. Reiko Okunishi on OHina sama installation day, February 14. The window filled with her creations makes people young and old, men and children stop and admire. They may just be self-portraits. The OHina sama follow me everywhere. 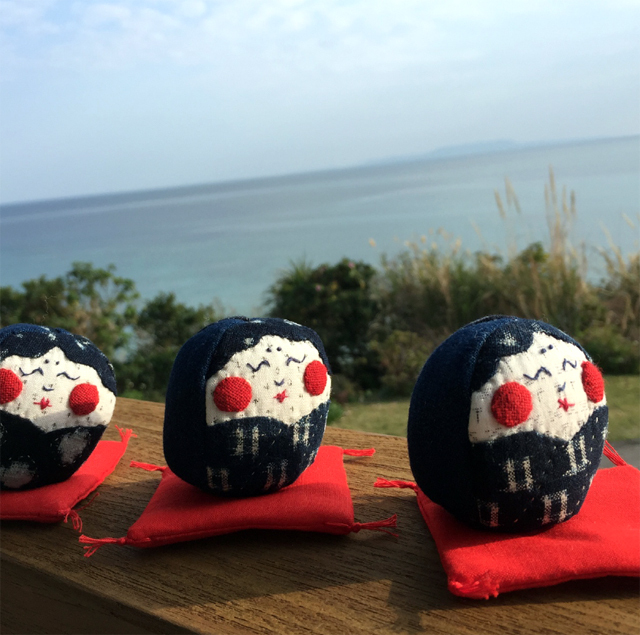 On a recent trip to Okinawa, they enjoyed basking in the sun on a glorious deck overlooking the East China Sea so much, that they decided to stay there. And bless the house. Such a lovely tribute. I so want to rush over and see Okunushi-sama’s wonderful exhibition. 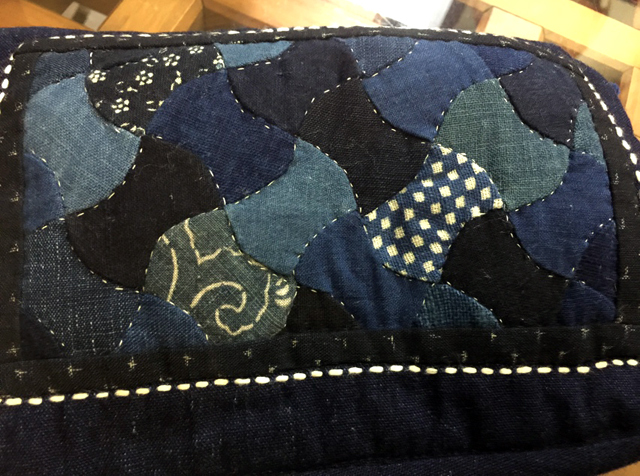 I’m a collector of quilts from the deep south in the US, made from old feed sacks and thrown away bits and pieces of material. 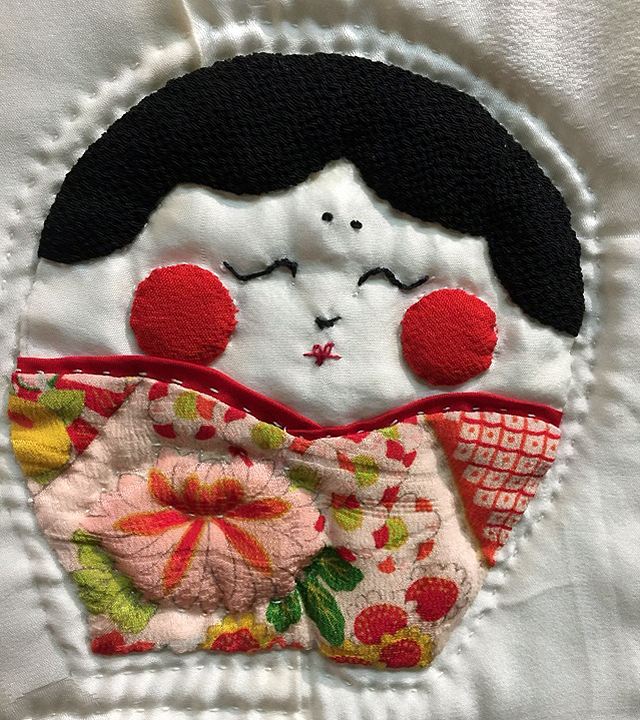 The beautiful remnants of Japanese textile craft make her work even more exceptional. i’d love to see your collection one day. Maybe something similar to Japanese Boro? Tattered farm and work clothes patched and patched and patched again. Blessings from downunder where we have no peach blossoms at hinasama time, but we make do with whatever blooms in the garden in early autumn. Amy, your post speaks just like you. Feel close to you at this moment. You are always close Margaret. Your lady in the shower greets me every morning and your tenugui always brings back happy happy times. Love this & all of your beautifully informative posts. 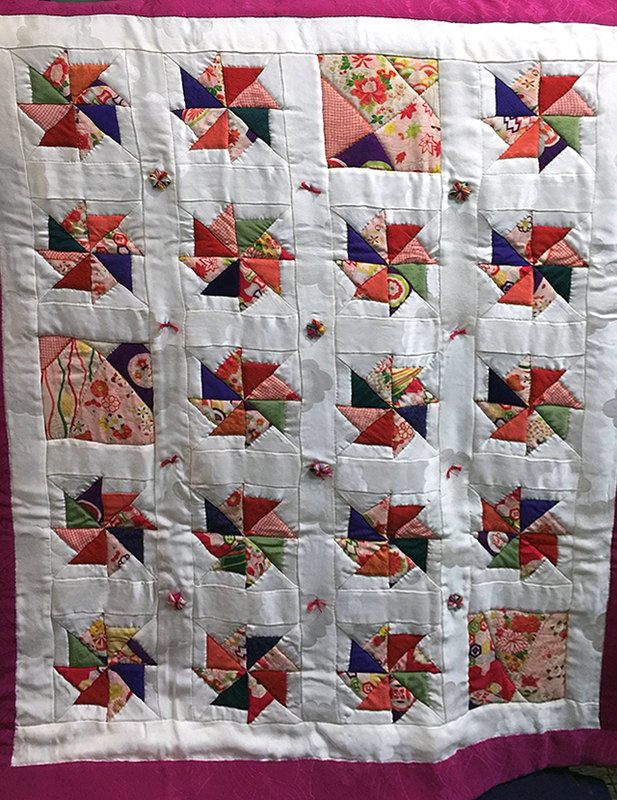 Please share with your talented quilter friend how the bright colors of these delightful stitched wonders have warmed us up here in snowbound Philadelphia PA USA. So glad we are melting your snow ! What a winter you have had. The quilts make you warm too!